For the canyon in West Virginia, see Smoke Hole Canyon. For the caves in West Virginia, see Smoke Hole Caverns. For the community, see Smoke Hole, West Virginia. 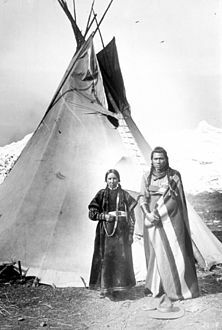 A tipi of the Nez Perce tribe, circa 1900. The excess fabric at the top of the structure is the smoke hole and smoke flaps. A smoke hole (smokehole, smoke-hole) is a hole in a roof for the smoke from a fire to vent. Before the invention of the smoke hood or chimney, dwellings had smoke holes to allow the smoke from the hearth to escape. Smoke holes were often built in a way such they would not leak water such as with a covering or in the gables. In the Native American long house, smoke holes occur in intervallic square openings along the roof. In Native American plains style tipi, the smoke hole consisted of one easily accessible smoke flap vent which was positioned around the apex of the interior beams and the flaps were extended outward on poles to open the vent. In modern ceremonial tipis this vent is in the traditional fashion. Sami tents called a lavvu also have a smoke hole from which smoke from a campfire is vented out the top. Unlike the Native American tipi however, there are no smoke flaps, just a round hole at the top of the tent. A large "open chimney" in a longhouse on Orkney. In the book It by Stephen King, the members of the losers club build a pit in their club, which they fill with green branches and set them on fire to create smoke. One of them talks about the ritual use of smoke-holes by Native Americans.